Last week, we moved to a new flat. New flat mates had a welcome party. 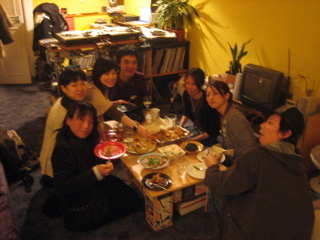 there were not only flat mate but many friends came, members were Oni, Akino, Toshimi and Asami who is Toshimi's sister. It was nice time and we ate many nice foods. 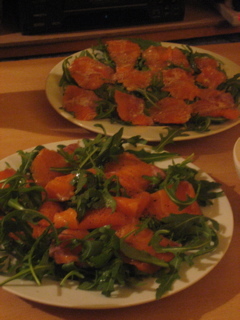 Nori made a fresh salad and salmon with sesame souse. 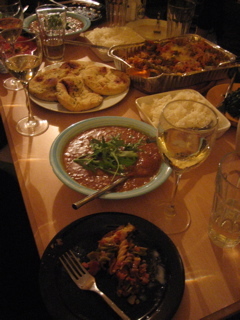 Harka made curry and rice, Haruka's friend Toshimi made gratan, and Nahomi made banana cake. 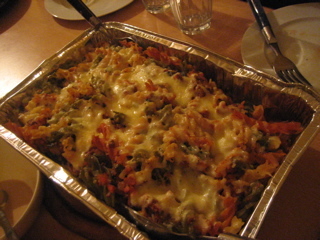 We enjoyed dishes and talked many things until midnight.